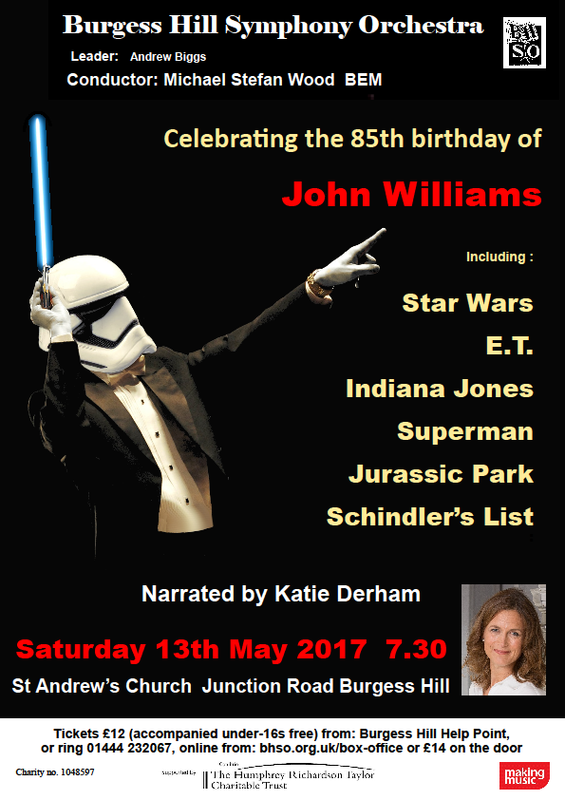 On Saturday 13th May 2017 at 7:30pm Burgess Hill Symphony Orchestra presented their Spring Concert at St. Andrew’s Church, Junction Road, Burgess Hill, RH15 0LG. This concert was narrated by BBC Proms presenter Katie Derham. This year we mark the 85th birthday of John Williams. Directed by Mike Wood BEM, the orchestra will celebrate this event with an exciting series of pieces from the many acclaimed film scores that he composed during his life. The programme has been expertly planned to showcase a wide spectrum of musical styles and emotions, from the tear jerking Schindler’s List ‘I Could Have Done More’ to the magical Flight to Neverland from Hook, and the perhaps less well-known jaunty theme from The Terminal. Fans of the Star Wars films are in for a treat too. This programme will appeal to all ages. Accompanied children are free.